This healthy doughnut recipe is baked, not fried and made without dairy, gluten and is naturally low in sugar. Instead of flour, I use bananas and protein powder for the base for a satiating none-bloating doughnut! Delicious. Serve up with the low-sugar frosting, have them plain or even drizzle with a little date syrup (I use it here in my Chunky Monkey ice-cream recipe). Give it a go – you’ll be amazed that you can actually eat & enjoy a doughnut… guilt-free. Okay… maybe I’m a little obsessed with protein stuff at the moment. Anything Quest, I’ll eat it. Hand me an egg and I’m happy. 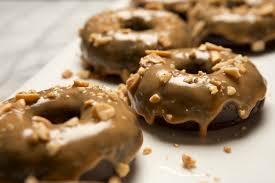 Give me a protein-rich doughnut recipe and I will sell my house for more of that sweet stuff. So it was a happy day when I stumbled across a protein-rich cake batter recipe. It got me thinking… if you can make cake batter to be full of protein and not a whole lot of sugar, surely you can make other cakey foods in a similar way? After a few failed attempts, I managed to make what I think is the ultimate doughnut recipe. It even comes 2nd to my other favourite recipe – homemade Tootsie Rolls, see the recipe here. These are great because they’re gluten-free, perfect for vegans, paleo eaters, sugar-conscious consumers and make for a wholesome post-workout snack which isn’t going to see you piling on the pounds! Chop the bananas and blend with the coconut oil. Puree in a blender until smooth. Add in the rest of the ingredients and blend until smoother still. Grease a doughnut or muffin pan (of course you won’t get the hole with these) with coconut oil, add the mixture ¾ of the way full in each case, and bake for 15 minutes at 180c. For the frosting, add the protein powder, oil, cacao powder and syrup in a large bowl and mix. As you mix, add a tablespoon of water each turn until the desired frosting consistency is reached. Spread onto the doughnuts once they’re golden brown and cooled down. Sprinkle the chocolate chips or chopped nuts on top.